This article is about the Christmas carol. For other uses, see Silent Night (disambiguation). "Silent Night" (German: "Stille Nacht, heilige Nacht") is a popular Christmas carol, composed in 1818 by Franz Xaver Gruber to lyrics by Joseph Mohr in the small town of Oberndorf bei Salzburg, Austria. It was declared an intangible cultural heritage by UNESCO in 2011. The song has been recorded by a large number of singers across many music genres. The version sung by Bing Crosby is the third best-selling single of all-time. The melody was composed by Franz Xaver Gruber, schoolmaster and organist in the nearby village of Arnsdorf. Before Christmas Eve, Mohr brought the words to Gruber and asked him to compose a melody and guitar accompaniment for the Christmas Eve mass, after river flooding had damaged the church organ. The church was eventually destroyed by repeated flooding and replaced with the Silent-Night-Chapel. It is unknown what inspired Mohr to write the lyrics, or what prompted him to create a new carol. According to Gruber, Karl Mauracher, an organ builder who serviced the instrument at the Obendorf church, was enamoured with the song, and took the composition home with him to the Zillertal. From there, two travelling families of folk singers, the Strassers and the Rainers, included the tune in their shows. The Rainers were already singing it around Christmas 1819, and once performed it for an audience that included Franz I of Austria and Alexander I of Russia, as well as making the first performance of the song in the U.S., in New York City in 1839. By the 1840s the song was well known in Lower Saxony and was reported to be a favourite of Frederick William IV of Prussia. During this period, the melody changed slightly to become the version that is commonly played today. Over the years, because the original manuscript had been lost, Mohr's name was forgotten and although Gruber was known to be the composer, many people assumed the melody was composed by a famous composer, and it was variously attributed to Haydn, Mozart, or Beethoven. However, a manuscript was discovered in 1995 in Mohr's handwriting and dated by researchers as c. 1820. 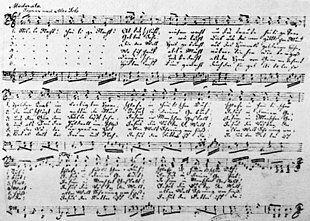 It states that Mohr wrote the words in 1816 when he was assigned to a pilgrim church in Mariapfarr, Austria, and shows that the music was composed by Gruber in 1818. This is the earliest manuscript that exists and the only one in Mohr's handwriting. 8 time and siciliana rhythm. Today, the lyrics and melody are in the public domain, although newer translations usually are not. In 1998 the Silent Night Museum in Salzburg commissioned a new English translation by Bettina Klein of Mohr's German lyrics. Whenever possible, (and mostly), Klein leaves the Young translation unchanged, but occasionally Klein (and Mohr) varies markedly. For example, Nur das traute hochheilige Paar, Holder Knabe im lockigen Haar is translated by Young: "Round yon Virgin mother and child, Holy infant so tender and mild" whereas Klein rewords it: "Round yon godly tender pair, Holy infant with curly hair", a translation closer to the original. Max Reger quotes the tune in the Christmas section of his organ pieces Sieben Stücke, Op. 145. Alfred Schnittke composed an arrangement of "Stille Nacht" for violin and piano in 1978, as a holiday greeting for violinist Gidon Kremer. Due to its dissonant and nightmarish character, the miniature caused a scandal in Austria. Several theatrical and television films depict how the song was ostensibly written. Most of them however are based on a spurious legend about the organ breaking down at the church in Oberndorf, which appeared in a fictional story published in the U.S. in the 1930s. ^ a b c d Daley, Jason (17 December 2018). "It's the Bicentennial of 'Silent Night': The classic Christmas tune was first composed as a poem, and it was set to music for the first time in the winter of 1818". Smithsonian.com. Smithsonian Institution. Retrieved 19 December 2018. ^ "Österreichische UNESCO-Kommission – Nationalagentur für das Immaterielle Kulturerbe – Austrian Inventory". Retrieved 25 December 2014. ^ a b c d Egan, Bill (December 1999). "Silent Night, Holy Night". Soundscapes. University of Groningen. 2. ISSN 1567-7745. Archived from the original on 16 December 2017. Retrieved 22 December 2017. ^ a b "Christmas carols". BBC. 4 August 2009. Archived from the original on 22 May 2009. Retrieved 6 December 2011. ^ a b "Spreading of the Song Locally". Silent Night Association. Archived from the original on 17 December 2017. Retrieved 22 December 2017. ^ "Origin of the Song". Silent Night Association. Archived from the original on 15 December 2017. Retrieved 22 December 2017. ^ Meredith Ellis Little (2001). Siciliana Archived 19 April 2016 at the Wayback Machine. Grove Music Online. ISBN 978-1561592630. ^ Guerrieri, Matthew (20 December 2014). "With 'Stille Nacht,' Schnittke couched protest in tradition". The Boston Globe. Archived from the original on 25 December 2017. Retrieved 24 December 2017. ^ Ross, Alex (28 September 1992). "Connoisseur of Chaos: Schnittke". The New Republic. Archived from the original on 29 June 2017. Retrieved 24 December 2017 – via The Rest Is Noise. ^ "Silent Night, Holy Night (TV Movie 1976)". IMDb. 27 December 2008. Archived from the original on 10 February 2017. Retrieved 17 February 2017. ^ "Silent Mouse (1988)". Turner Classic Movies. Archived from the original on 8 December 2015. Retrieved 29 November 2015. ^ "Buster and Chauncey's Silent Night". Turner Classic Movies. Archived from the original on 23 November 2016. Retrieved 23 November 2016. ^ "Silent Night | Movieguide | Movie Reviews for Christians". Movieguide. Archived from the original on 10 September 2017. Retrieved 17 February 2017. Wikimedia Commons has media related to Silent Night. This page was last edited on 20 April 2019, at 10:00 (UTC).